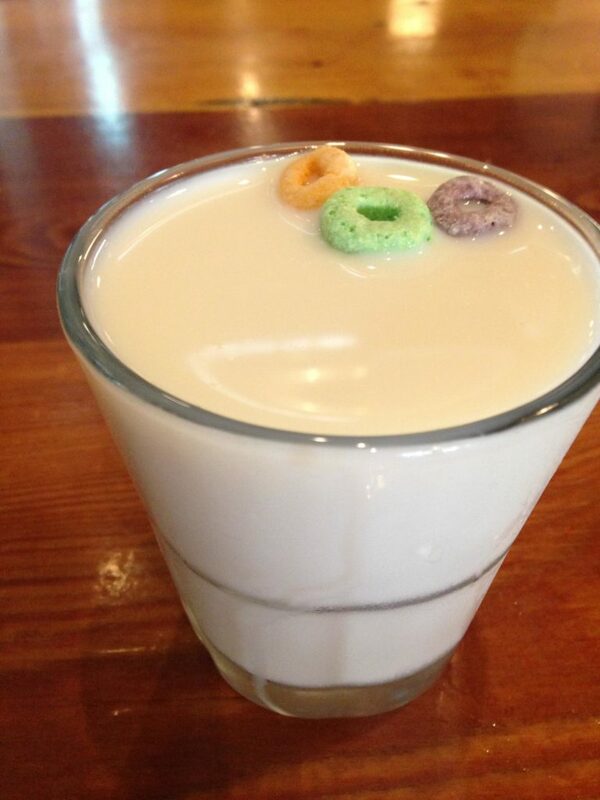 Cereal Milk cocktail at The Roost, 920 Massachusetts St.
Those who enjoy slurping up the milk sitting in the bottom of the bowl once the cereal has been eaten will enjoy the Cereal Milk breakfast cocktail. Combining Prairie vodka, Frosted Flakes-infused whole milk, caramel and a few floating Fruit Loops, it’s a sweet and creamy concoction for cereal-lovers. The sugary, infused milk accounts for the majority of flavor, completely disguising the vodka, resulting in a “surprise” buzz at the bottom of the glass. It’s also worth noting that it’s impossible to feel like an adult with this Fruit Loop-garnished glass of milk in hand. Where it’s served:The Roost, 920 Massachusetts St.
Other libations at this location: A number of breakfast and brunch cocktails including six different bloody marys, four sparkling cocktails spiked with prosecco, and five specialty Roost cocktails like the Tequila Sage (with carrot juice, lemon, orange, agave nectar and ginger beer) or Deadwood (rye whiskey, Cointreau, orange bitters, honey and mint). It’s safe to say the extensive morning drink menu helps account for the long wait for brunch seating every weekend.